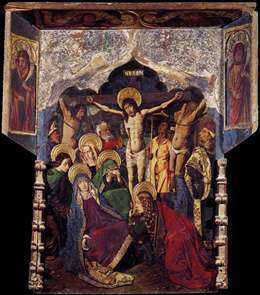 One of the leading Spanish artists of the last third of the fifteenth century was Bartolom Bermejo. 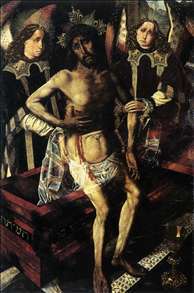 The signature Bartolomeus Vermeio Cordubensis on the Pietà in Barcelona cathedral, one of his later works, completed in 1490, indicates that he was born in Cordoba. At the same time, there is nothing in the Andalusian art of that period to explain the origin of his style or the source of his technique. 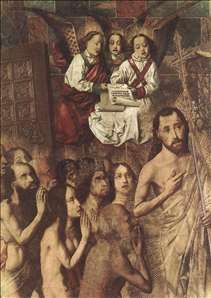 It is assumed that Bermejo studied in Flanders, perhaps in direct contact with Dirk Bouts, with whom he has certain stylistic affinities. In spite of this Flemish training, Bermejo s work leaves us in no doubt concerning his Spanish origin. Robust, virile, and dramatic, it is characterized by a profound gravity, the counterpart of the lyrical refinement so typical of the Spanish genius. The career of the artist is roughly marked out by the traces of his influence and a few recorded dates. 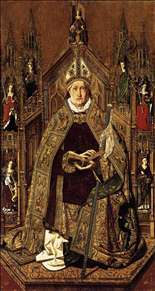 Restless by temperament, he worked in various centers, the chief of these being Valencia, where he painted an admirable St Michael (now in private collection in England). 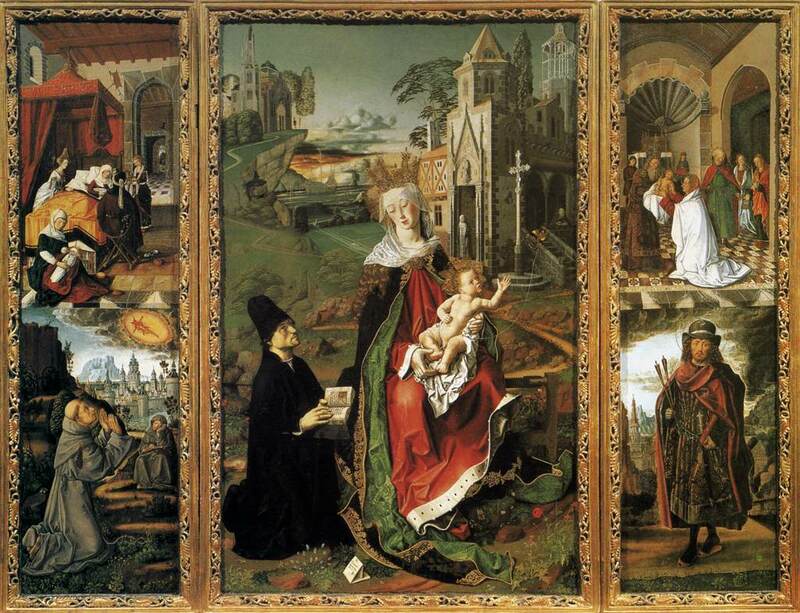 This is an intensely stylized work with accurately rendered textures, marvelously decorative by virtue of its color harmonies and rythms. 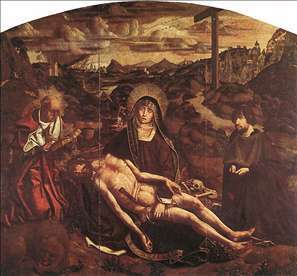 The center panel of an altarpiece of the Virgin now in Aqui (Italy) is evidently of later date. The background is a beautifully observed landscape, but the chief interest of the painting lies in the strong sculptural modeling of the figures. 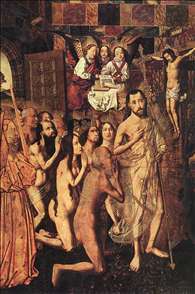 Between 1474 and 1477 Bermejo must have worked in Aragon, on the altarpiece of Santa Engracia, originally in Daroca and now divided among various collections, and on the impressive altarpiece of St Dominic of Silos, now in the Prado. 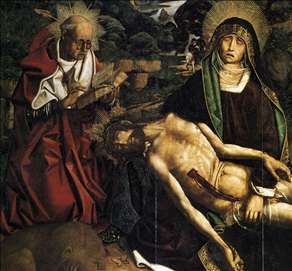 In 1486 Bermejo was in Barcelona where he painted a Pietà in 1490. That this is a work of Bermejo s maturity is clear both from the inimitable quality of the background landscape, with its grazing light, advanced naturalism, and spatial freedom, and from the dramatic severity both of the figures and of the atmosphere that surrounds them. See more details about "Christ Leading the Patriarchs to the Paradise"
See more details about "Christ Leading the Patriarchs to the Paradise "
See more details about "Christ at the Tomb Supported by Two Angels"
See more details about "St Dominic Enthroned in Glory"
See more details about "Retable of the Virgin of Montserrat"
See more details about "Pietà of Canon Luis Desplá"
See more details about "Pietà of Canon Luis Desplá "